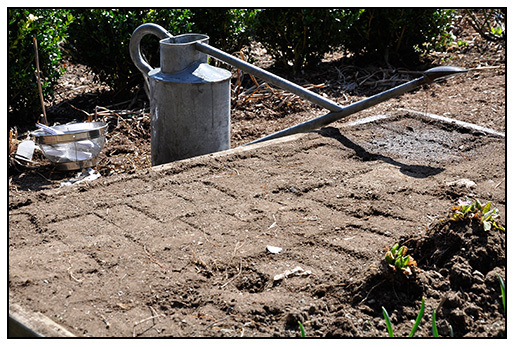 Troughs were invented by Victorian gardeners, turning stone sinks from old farms into gravelly filled containers in which they could grow plants collected from the high mountain peaks - rage in England around the turn of the centruy. 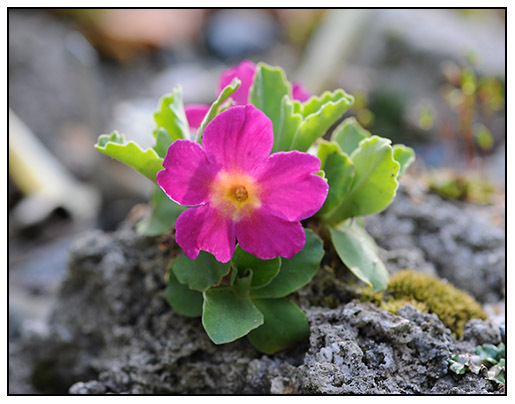 Today, real stone toughs are too costly, but ones called 'Hyper-tufa', constructed out of concrete and other materials are used by enthusiasts who want to master growing high elevation alpine plants such as this primrose from the alps, Primula marginata, which is growing in a piece of real tufa rock, a limestone rock that is porous enough for roots to pass through it. 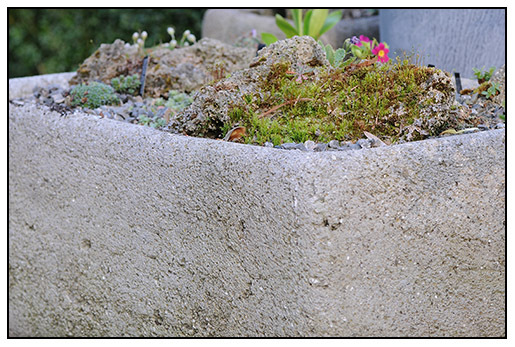 A "hyper-tufa" trough planted with alpine plants. I have never received so many emails than I have about my last post where I confess that I have a case of 'trough snobbery'. My intention was not to piss off anyone, I encourage anyone to practice creative gardening, and although there are rules in gardening, like cooking, rules can be broken - so go for it. But I would like to remind you that my blog is a personal venture which focuses not on common practices, ease or about short-cuts. My blog has to honest, and authentic - and I let's face it - Joe and I are not about common gardening! We're kind-of experienced, both of us are nearly life-long gardeners and plant collectors, and to anyone who has visited us - our gardens and greenhouse hardly represents the average gardener! I am beyond being a geek with many types of plants, from vegetable culture to bulbs and specialty gardens. 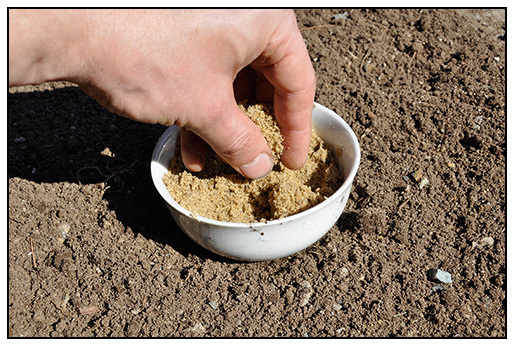 I try to make this blog to be more interesting, more informative, to share not only experience and knowledge, but also to inspire both new and mature Gardners to try somethings new, to retry something that they may have failed at with before. 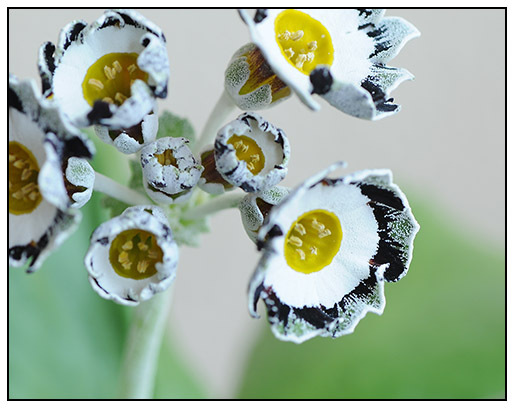 Many primula species are alpine forms, but even though this Primula auricula has relatives that come from the Alps, this one is considered a 'Show Auricula', and requires a little more care than even a trough can provide due to the white farina that appears on the petals which the rain can damage. Still, this Auricula grows fine in many of my deeper troughs, as long as they don't freeze and thaw too many times during the winter. 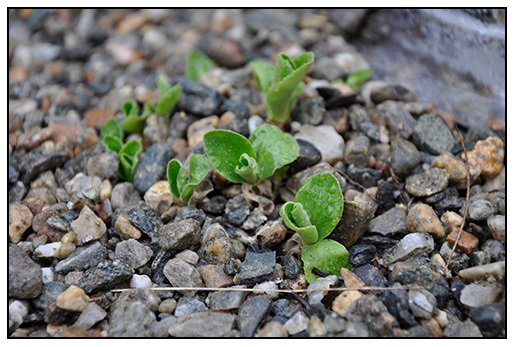 It's not the cold, for P. auricula can be mastered in Alaska, it's more about the thaw, refreeze cycle that damages roots. 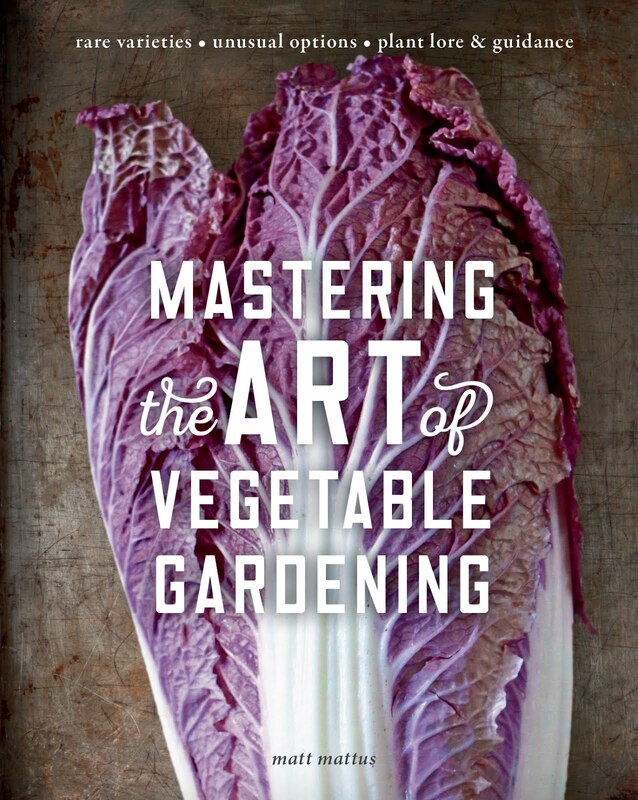 With gardening, you can choose to be casual, or serious - it's up to you. 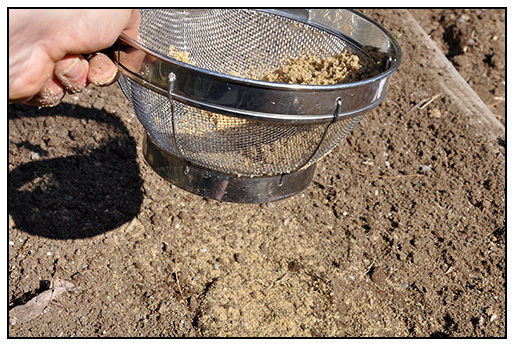 There are plenty of very nice blogs out there about which document new gardeners as they learn, try, and sometimes even fail with their gardens. 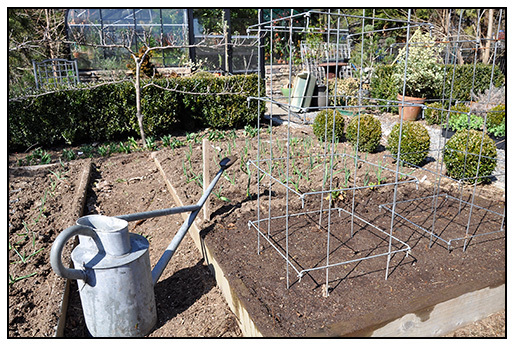 All essential in growing as a gardener, but my blog is not really about that. 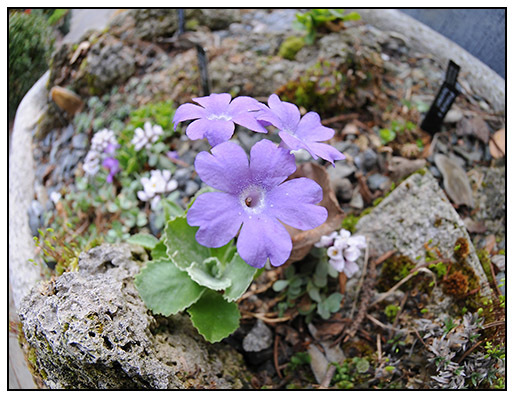 Another alpine form of primrose, Primula allionii, grows from a cutting that rooted in a hole that was drilled into a soft tufa rock, and refilled with tufa-rock powder. This method keeps the plants tight and 'in character', which means that they look like the ones growing in the wild. Today, we live in a sound-bite culture. A culture of dumbed down, easyfied segments that are simplifying everything down to three sentences, or 5 easy steps - from cupcakes, to windowboxes. And that's OK, but for some of you, it's just not enough information for me, or for my readers - that's just he position I take with this blog. 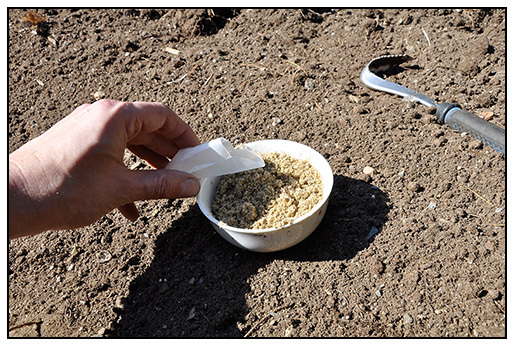 Sure - other blogs might just tell you that poppies are huge this year, or they may show you how to use poppies in your wedding bouquet, but I know that many of you are running out there buying poppy seed, but a little confused on where to turn on how to grow them. I am here to tell you the truth - that sometime they are hard to grow. That sometimes, you might be disappointed with the results; but most importantly, that I will at the very least, try to grow them the right way with you if I have not, or, share with you how I grow them, in case you want to try that method. 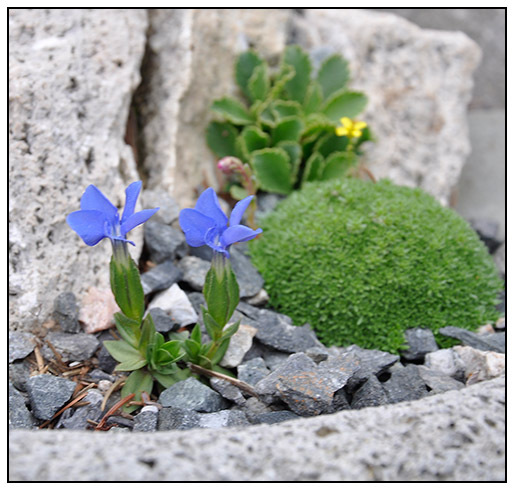 There are gentians for the rock garden, and then, there are some that really thrive in troughs because they are too small and can get lost in the garden. Gentiana verna grows well in troughs, and will form a nice clump with care. It's not easy, but after a few failures, you will find the right place, I assure you. The reason why many blogs are now so popular is that you the reader can choose what you want to learn about, since sadly, the corporate direction that mass media is moving towards, and a more simplified message. 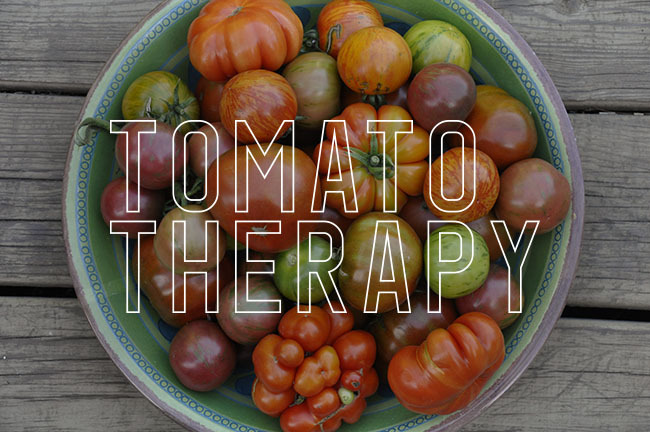 I love Martha Stewart Living, but you may have noticed how the focus has moved from authentic gardening, to simplified gardening. I get it, surely there is research that shows that viewers want more step-by-step easy solutions rather than a detailed exploration of let's say, Iris species, as the magazine once focused on when Martha herself was in charge. I work for a large Fortune 500 design company, so I know that the bottom line always trumps a singular creative vision. The fact is there are more viewers who want to pop a pansy out of a six pack, and shove it into an Martha Stewart at Macy's Easter bowl for their table, than there are those who want ( or can afford to) plant 600 varieties peonies in their cut flower garden. 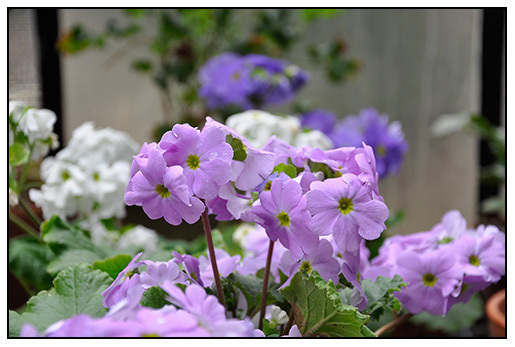 FOR THE GREENHOUSE OR COLD WINDOWSILL ONLY, PRIMULA OBCONICA CANNOT SURVIVE OUTDOORS IN ZONES 9 OR LOWER. I HAVE ALWAYS LOVED P. OBCONICA, BUT THEY ARE HARD TO FIND TODAY. THEY ARE BEST AS A SHORT-LIVED POT PLANT FOR THE COOL MONTHS. With the advent of spring, comes primroses - but there are many species available, and although most are cold-growing, many people struggle with keeping primroses in the garden. Later next month, I will review the various types available, and their culture, for you might be surprised that they are not a difficult to grow and one may believe, for now, I share this weeks chores with some of the primula species I keep. THE DELICATE TINTS OF PRIMULA OBCONICA COME WITH AN EVIL SIDE EFFECT TO SOME. Primula obconica was once more common than it is today. 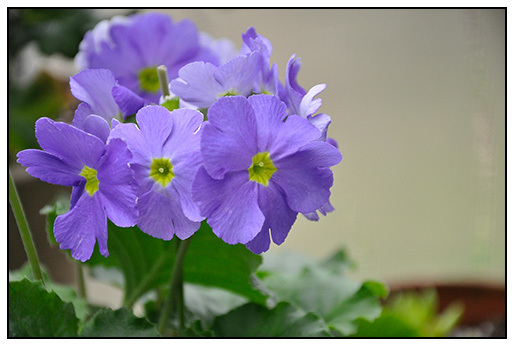 There are three types of primroses sold as potted plants in the winter months for indoor display, but the least common is Primula obconica, due to earlier varieties having more primulin in their leaves, held within tiny hairs that could prick the skin, and cause a contact dermatitis, which some people still get from many primula. Not to scare you, but all primula can cause this problem if you handle them enough, or, if you have a sensitivity to them, and P. obconica is the coomon cause - but that aside, it is perhaps the most beautiful of potted primula, common in the victorian greenhouses and conservatories, growing in an attractive array of violet tints and periwinkle purple, magenta and white, it is helpful to know that modern selections have been bred to have much less primulin in the leaves, and most people never even know about the risk of rash. PRIMULA FARINOSA EMERGING IN AN ALPINE THROUGH. THE BIRD'S EYE PRIMROSE, THIS SPECIES IS TYPICALLY SEEN GROWING IN HIGH ALPINE MEADOWS IN THE ALPS. IT GROWS BEST AS AN ANNUAL, FROM SEED SOWN THE PREVIOUS SUMMER. In the garden, or specifically, in the alpine troughs, high-elevation primula are awakening. Some require a little care, particularly the highest alpine forms of P. auricula and P. marginata, which tend to develop wood stems with a tuft of leaves at the end. 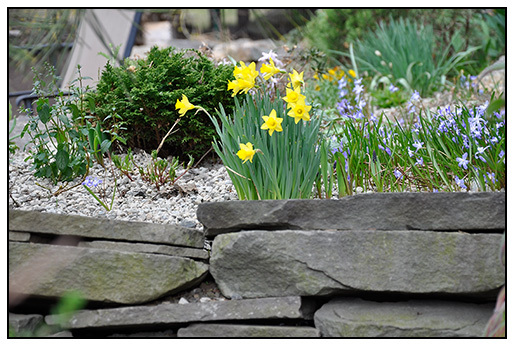 These are plants designed to grow in tight, mountain crevices and screes, where tiny gravel and rock chips break off of the highest peaks, and tumble down into the crevice, filling in a sort-of natural mulch all year long. 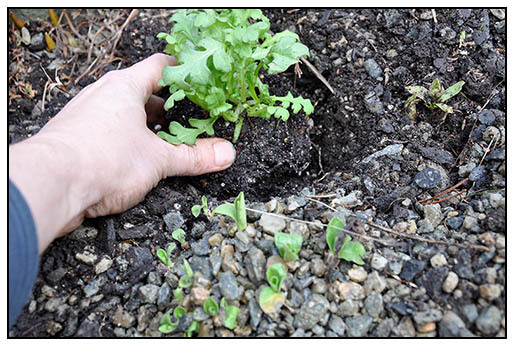 Scree plants often grow in gardened at low elevations with these long, bare stems, since tumbling rocks rarely exist in the home garden. 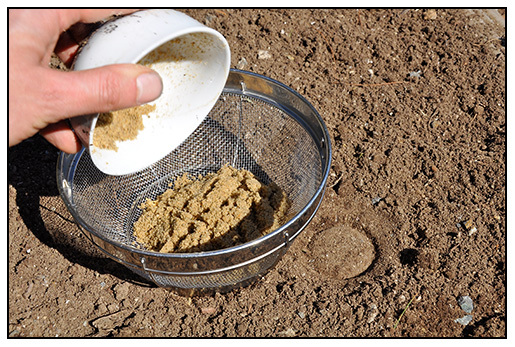 So a little ingenuity is required ( arriving as a bucket of sharp gravel). 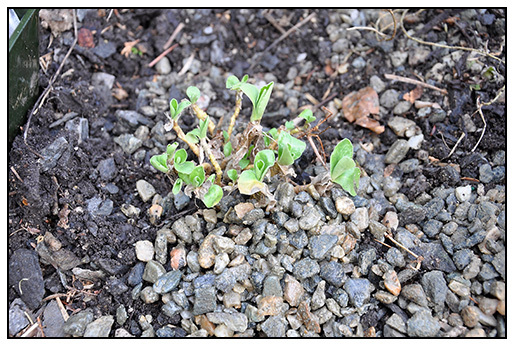 I apply a new layer to my scree garden plants every spring, placing gravel chips of granite around the plants until only their leaves are left showing. This works well with Primula marginata, which could also be dug and planted deeper every year too as an option. THE ALPINE TROUGHS ARE COMING TO LIFE EARLY THIS YEAR. NOTICE THE PRIMULA MARGINATA AT THE TOP, WITH DENTATED, TOOTHED LEAVES COVERED IN A POWDER CALLED FARINA. A PRIMULA AURICULA IN THE ALPINE GARDEN IN NEED OF A NEW MULCH OF GRAVEL TO RAISE THE SOIL LEVEL. 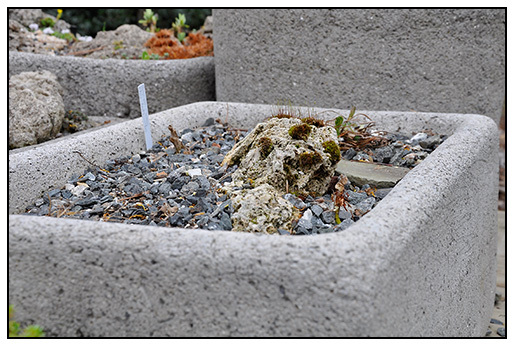 SOME ALPINE TROUGHS BADLY IN NEED OF A NEW SET OF PLANTS. SOMETIMES, FAILURE OCCURS, DUE TO CLOGGED DRAINAGE HOLES AND FREEZING WATER. I HATE TROUGHS PLANTED WITH SUCCULENTS OR HENS AND CHICKS, AS I FEEL THEY ARE AMATEUR AND A BIT INAUTHENTIC FOR ME ( I KNOW -PLANT GEEK!) , SO TRUE ALPINES WILL BE PLANTED IN THESE - SAXIFRAGES, GENTIANS AND LEWISIA ARE ON THEIR WAY! 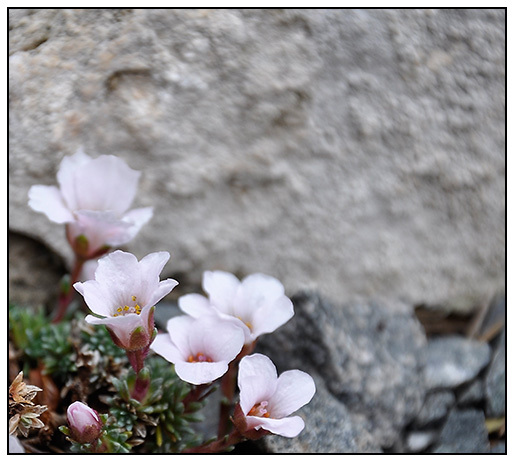 SPEAKING OF ALPINES - SAXIFRAGA SPECIES ARE STARTING TO BLOOM IN THE TUFA ROCK TROUGHS ! 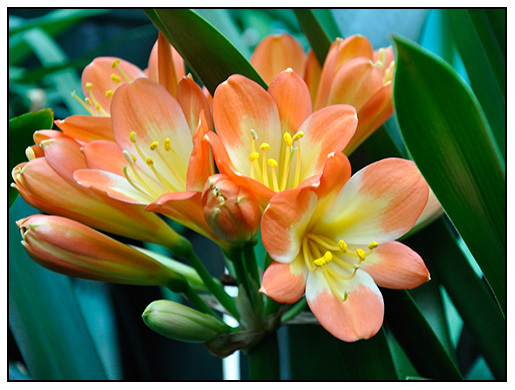 March is traditionally clivia season, at least in New England where these potted South African natives appear in spring flower shows, in parlors of old homes, and in plant windows hopefully in bloom if you are handy with these notoriously shy bloomers - yes, Clivia can be challenging for many to coax into bloom, at least indoors, but once grown in the greenhouse, they seem bloom on schedule every year, never missing a beat - proving that the trick is not withholding water, but actually is the blend of seasonal climate change - cold nights, lengthening daylight and a temperature shift is the magical recipe. 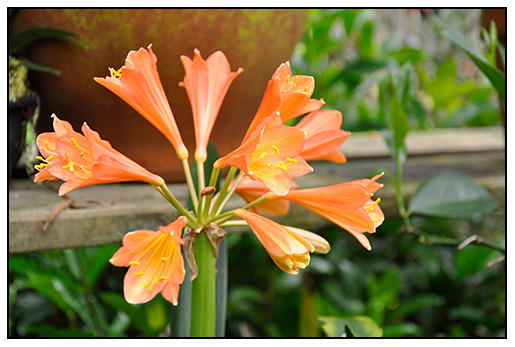 We happen to grow a few hundred clivia, most leftover from a load of seed we brought back from Japan in 2001 when we were in the depths of our clivia mania. The results from that one, fateful trip to Mr. Nakamura's tiny, simple home - deep in a quiet bamboo forest with nothing but the sound of nightingales and the breeze in rural Chiba prefecture north of Tokyo. We returned with dozens of plants, and a large mesh bag of seeds which we promptly planted, and the last are just coming into bloom. I thought that I might share a few. SOMETIME, ORANGE CLIVIAS CAN BE ALMOST RED. THIS ONE STANDS OUT FROM THE TWO DOZEN THAT ARE IN BLOOM NOW AS THE DARKEST ONE. I AM GUESSING THAT THIS ONE, WHICH GETS A SLIGHT BURGUNDY TINT TO THE OUTSIDE OF THE PETALS, HAS SOME INTERSPECIFIC GENES IN THE MIX. THIS IS THE FOURTH YEAR THAT IT HAS BLOOMED, AND IT REMAINS A FAVORITE BECAUSE THE FLOWERS ARE LARGE, AND THE FORM OVERALL IS SOLID. THIS YELLOW FORM LOOKS WHITE, BUT IT'S JUST A POOR PHOTO. THE PETAL SHAPE IS WHAT INTERESTS ME. ALMOST SPIDER LIKE. A WIDE PETALED PALE YELLOW SEEDLING. THIS SEEDLING HAS A DEEPER YELLOW CENTER, AND NEARLY PERFECT FLORAL FORM. Narcissus moscatus is one of the loveliest but increasingly scarce, Narcissus species. 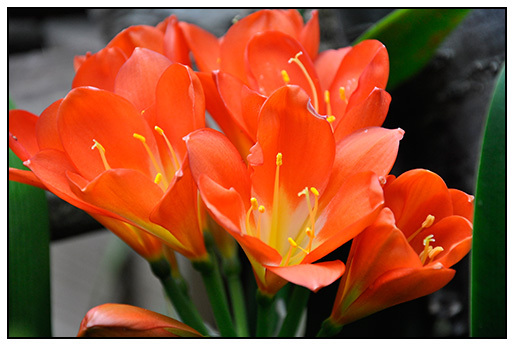 Closely related to N. alpestris, this bulb takes a few years to get established, but once it does, it divides nicely. Nodding, milk white trumpets hang their heads downward. 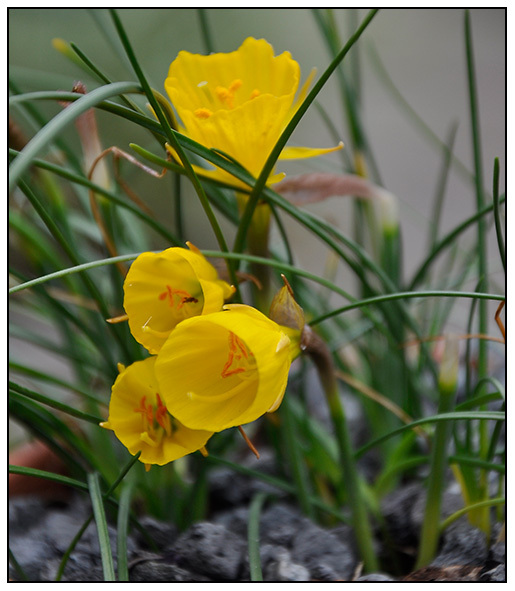 Rarely seen in this country are collections of potted rare bulbs, especially miniature narcissus which require either an alpine house ( a cold greenhouse which never freezes or cold frames, where pots of bulbs can remain quiet and unfrozen until ready to grow and bloom). In the UK, there are some enthusiasts who continue to collect and exhibit potted bulb collections, but in the US, they are difficult to keep well, as our summers are too hot, and our winters too cold. I am fascinated by such collections those of rare bulbs in pots from another time, so I try to keep a few around, either potted in the coldest corners of my greenhouse, or, under benches where the frost nearly reaches them. A few too, I keep in the raise alpine beds which surround the foundation of the greenhouse, were the bulbs are kept unfrozen, and provide some color and delight in early spring. A gorgeous species for the garden, closely related to the fabledalpestris and considered by some to be the same plant (not us!). Lovely milk white trumpets hang their heads towards the ground in March-April. One of the loveliest but increasingly scarce now. 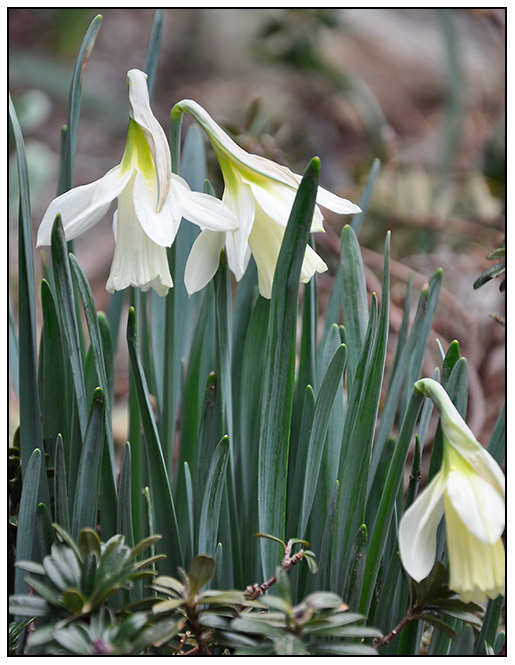 The crosses from Narcissus triandrus ssp. triandus are always choice, and the finest have always been rather tender, needing dry summers and protection from deep frosts, so bulb collectors often keep them in pots. This pot has grown from three bulbs planted ten years ago ( it's double potted for two reasons - so that I will remember that this is an important bulb when it goes dormant, and two - because I feel that the extra gravel keeps the temperature and moisture more consistent. This species like fast drainage, and a bone-dry summer, so the pot may come out in March to bloom, but they go back into the greenhouse for the summer, where the pots can bake in the hot sun. 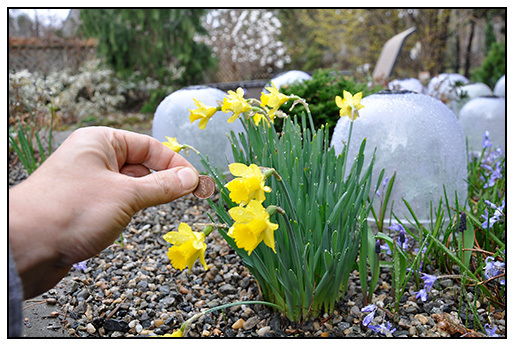 NARCISSUS 'LITTLE GEM' IS NOT RARE, BUT AS YOU CAN SEE, IT FOOLS THE EYE. IT LOOKS EXACTLY LIKE A LARGE DAFFODIL, BUT ABOUT 20 TIMES SMALLER! 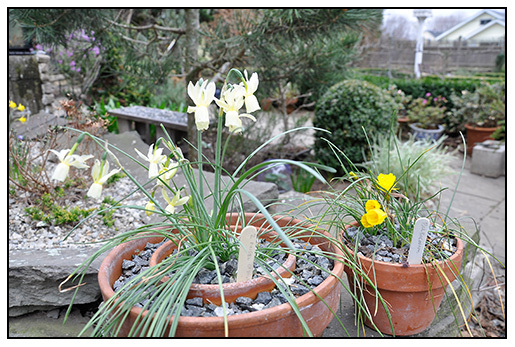 NARCISSUS ARE THE BEST VALUE FOR GARDENERS, BECAUSE THEY ARE AMONGST THE MOST LONG-LIVED OF BULBS. 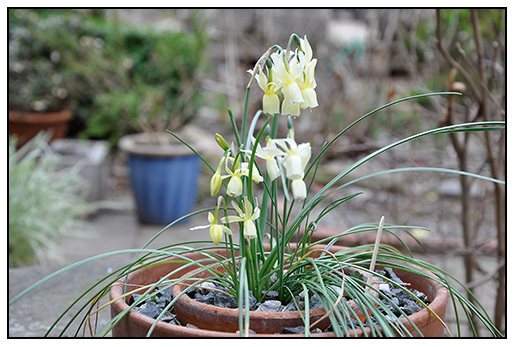 NARCISSUS IN POTS CAN HANDLE THE COLD WEATHER WITH NARY A NOD, IT'S THE HEAT THAT THEY CANNOT STAND. 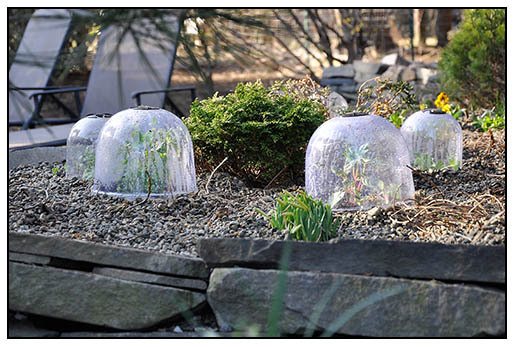 WITH TEMPS FALLING INTO THE HIGH TWENTIES TOMORROW NIGHT, THESE BULBS WILL REMAIN OUTSIDE. 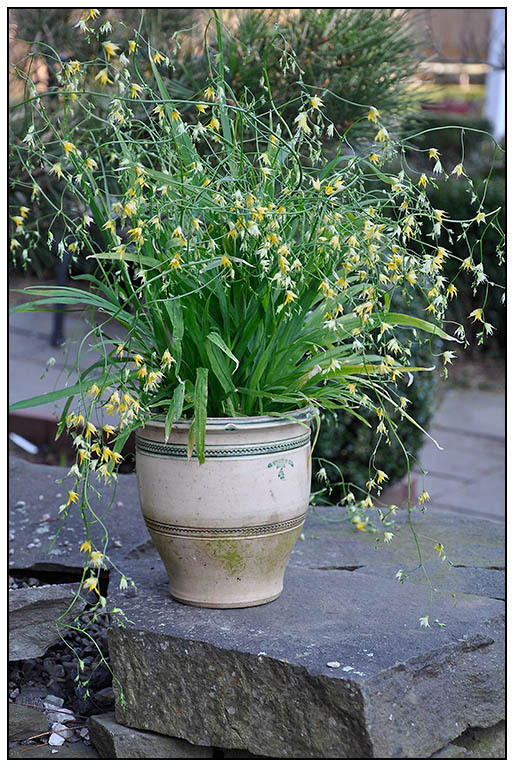 THE HOOP NARCISSUS, OR BULBOCODIUM TYPES PERFORM BETTER IN POTS FOR ME, THAN IN THE GARDEN. I ALWAYS KEEP POTS FULL WHICH BLOOM MOST OF THE WINTER IN THE COLD GREENHOUSE. 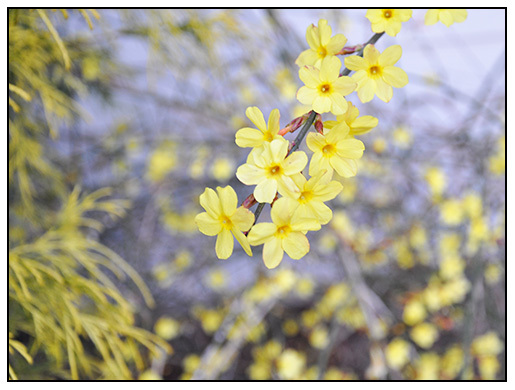 THIS YELLOW SPECIES IS THE LAST ONE OF THE YEAR, OFTEN BLOOMING IN MARCH OR APRIL. March Madness - Natives vs Non natives fight for survival in the warmest spring ever. OUR NATIVE ( AND STATE WILDFLOWER FOR MASSACHUSETTS) MAYFLOWER,DESPITE ITS NAME, TYPICALLY BLOOMS IN MARCH - MOST NATIVE PLANTS EMERGE LATER THAN IMPORTED ONES - WHICH IS WHY ONE NOTICES THE MORE SUSCEPTIBLE SPECIES WHEN EARLY SPRING WEATHER FORCED THEM TO JUMP - THEY OBVIOUS CANDIDATES?- FORSYTHIA, MAGNOLIA, APPLES, CRAB. BRADFORD PEARS - THEY'RE ALL A LITTLE STUPID - TAKE A LOOK AT YOUR LOCAL FOREST, AND SEE HOW MANY TREES ARE IN FULL BLOOM VS THOSE AT YOUR SUPERMARKET PARKING LOT. TAKE A LOOK AT YOUR LOCAL FOREST, AND SEE HOW MANY TREES ARE IN FULL BLOOM VS THOSE AT YOUR SUPERMARKET PARKING LOT.It's easy to pick out the native trees and shrubs from the imported ones. Just take a look at the Bradford Pears at bloom at your local gas station or supermarket parking lot, and then take a glance at your local forest - in most spring's, the forests remain brown while foundation plantings and nurseries pitch pots of yellow forsythia, flouncy Magnolias and purple rhododendrons - in full bloom. When the seasons merge, and in years like this one, when record-breaking warmth arrives even earlier, these imported species bloom, blindly believing that summer is near, but typically, native species are much later. What concerns many of us gardening types this year, is that across the US, the weather is not only off, it's record-breakingly off, and not just hot for a day or two, but much warmer than every before in recorded history - and that temperature range is so broad, that it's not as if the highs are just a couple of degrees warmer, but often more than 20 degree's warmer. This strange state of our climate is not only forcing imported species to bloom and sprout even earlier, it is tricking the native species to emerge earlier, which is the more concerning issue at hand. Here in Massachusetts, the temperatures are soaring into the 70's 80's for the seventh day in a row. Not unheard of for a day or two in New England, but this is going on for over a week now. So as non-gardeners yap about how they hope this happens every year, those of us who know about such things, are preparing as best we can for the end of the world botanically speaking. 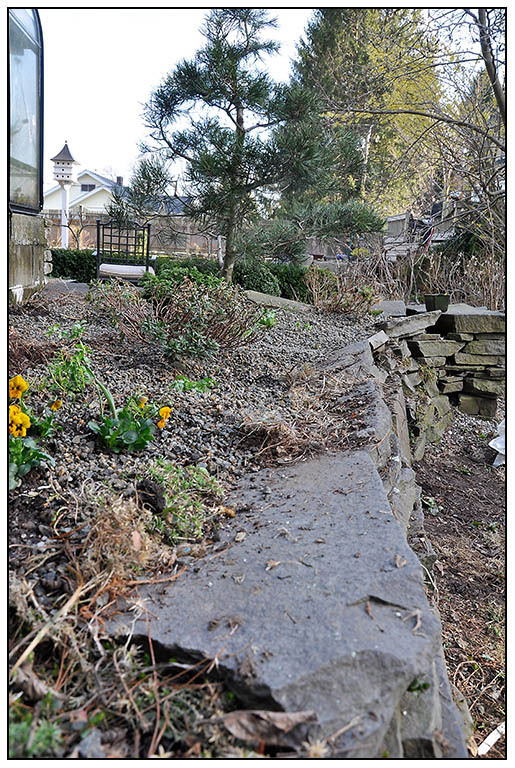 Or at least, the end of some plants in our gardens. It can ( and most likely will) happen next week, as temperatures drop back to a more 'normal' range in the thirties and forties - our typical seasonal temperature average for today is 38 deg. F. So if you are like the girl who was cashing us out at the register last night at the supermarket, who was "so psyched about this hot weather" you might not care that many plants will be severely damaged over the next month, if the temperatures return to normal. Whatever the cause, be it global warming, or a shift in the tilt of the earth due to earth quakes, or the end of the world, the plants are telling us something - and it's all a little scary. Ten years ago the temperature dropped in Mid May to 26 degrees, and many native oaks and ash trees were lost. Since this is only late March, anything can happen. Not all Magnolias are created equal. 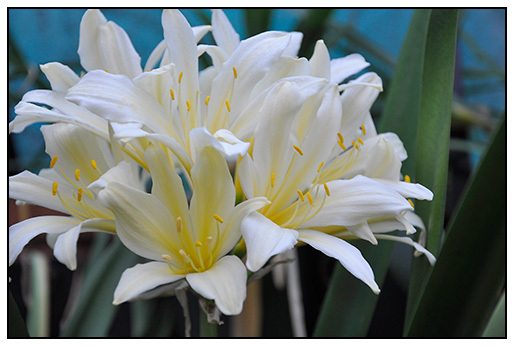 This M. stellata is designed for early bloom, often blooming in April for us in mild years. Given that this is late March, I am not that concerned with this species - but the larger species and hybrids of Magnolia x soulangeana are dangerously in peril if the temperatures drop lower than 26 degrees F. once new growth emerges. Let's face it, they normally are nipped by late frosts here in New England, but this year it is worse, since the native trees are even emerging from their sleep. 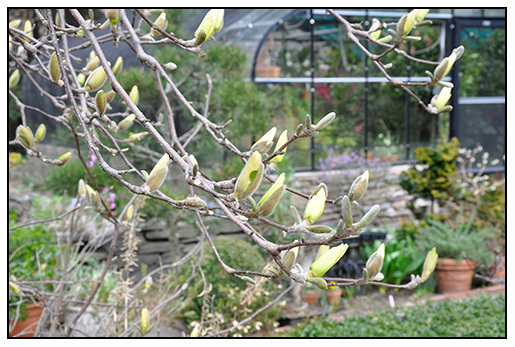 The blossoms are often damaged in mid-May when this Magnolias normally bloom, but given that this is late March? I am holding little hope. A YELLOW MAGNOLIA, THAT WAS DAMAGED BY OUR FREAK OCTOBER BLIZZARD, NOW HAS TO DEAL WITH BLOSSOMS AND NEW GROWTH EMERGING FIVE WEEKS EARLIER THAN LAST YEAR. WITH TEMPS EXPECTED TO DROP DOWN TO 26 DEG. F ON MONDAY, I HAVE LITTLE HOPE FOR THIS TREE. Avoiding frost damage on trees and shrubs depends on many factors, but mostly it depends on where the species you are growing comes from. 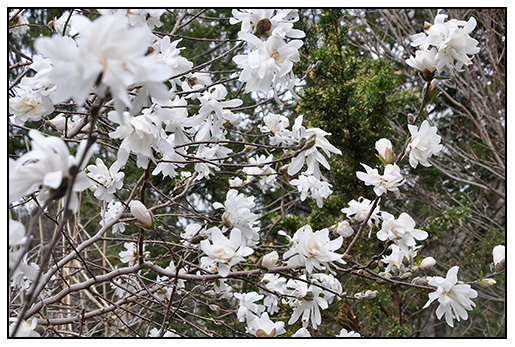 Magnolias from warmer parts of China may emerge early, but they are often not accustomed to early frosts in their native lands, so frost damage in common. Elevation factors in, especially if the species hails from colder areas of Japan or China, where many plants are used to emerging early to take advantage of specific pollinators or the wind. 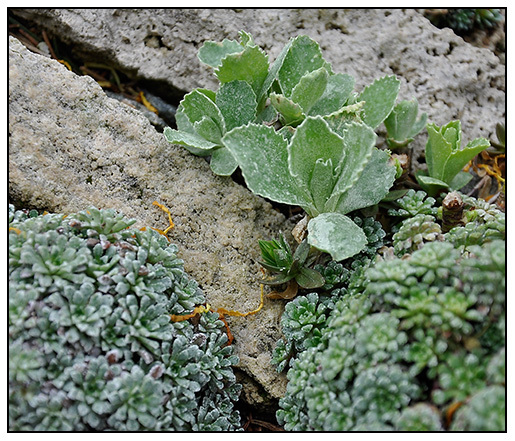 Alpine plants may bloom early and can handle hard frosts with little damage. 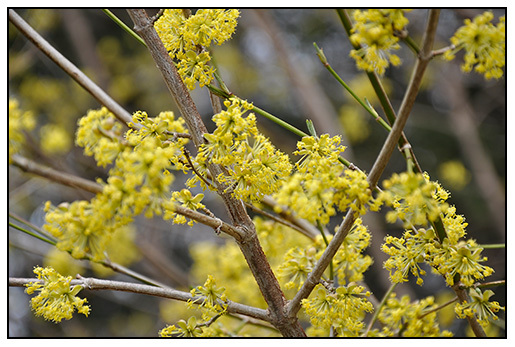 CORNUS MAS, A CHINESE SPECIES OF DOGWOOD, TYPICALLY BLOOMS FOR US IN FEBRUARY, SO ACTUALLY, THIS ONE IS BLOOMING LATE. FROST WILL NOT AFFECT THE BLOSSOMS. 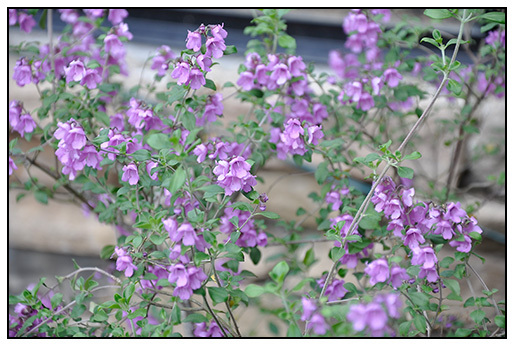 TENDER SHRUBS, SUCH AS THIS AUSTRALIAN MINT SHRUB - PROSTANTHERA, CAN OFTEN HANDLE LIGHT FROST, BUT GIVEN THAT THIS POTTED SPECIMEN SPENT THE WINTER IN THE GREENHOUSE, I WILL RETURN IT TO THE PROTECTION OF GLASS, IF THE WEATHER SHIFTS COLDER. 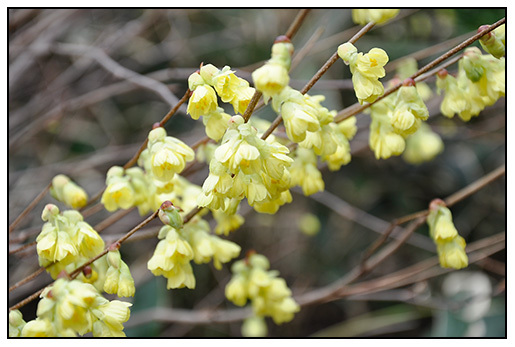 CORYLOPSIS IS NATIVE TO CHINA, BUT IT TOO BLOOMS EARLIER, EVEN IN COLD SPRINGS. LITTLE DAMAGE IS EXPECTED, EXCEPT PERHAPS TO TENDER NEW GROWTH. 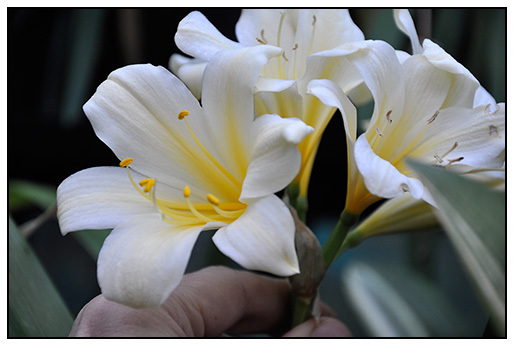 Dutch bulbs such as narcissus and Chinodoxa, Crocus etc will all survive frosts, even freezes and snow without damage. 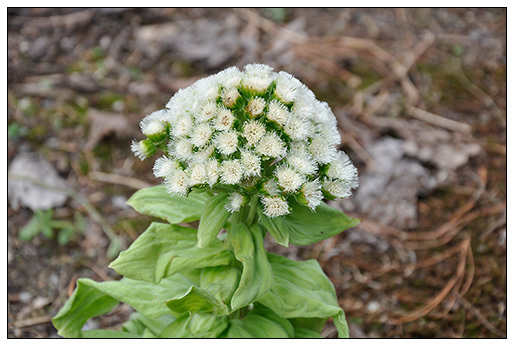 Cold-hardy perennials such as the Japanese Butter Bur ( Petasites japonicus) normally blooms very early for us, sometimes in January, but these late spring blossoms are undamaged by frost. 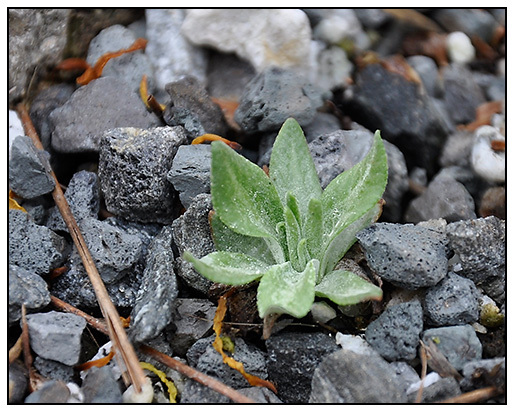 This is a plant that grows in high mountain valleys in the wild, and being a snow-melt plant, is designed for early emergence - the foliage follows later. I'm a risk-taker. So I can't help myself with all of the unseasonably warm and record-breaking weather in the eastern US, I've been moved to plant a Californian garden in what was my alpine garden - might as well lean into whole global warming thing! I've been addicted to Annie's Annuals ( try ordering from them....their plants are impressive), and with two orders arriving this week complete with hard-to-grow annuals for those of in the North East, I am cheating a bit, and planting some already started plants of Schizanthus, Nemophila, Clarkia's, Alonsoa and more, hoping that since we have not has a frost in two weeks, that maybe it will stay cool and frost free until mid-June. A Schizanthus grahamii from Annie's Annuals, grown in California, it arrives in a 4" pot, as if I started it in November. A little bit of luxury for my raised rock bed. 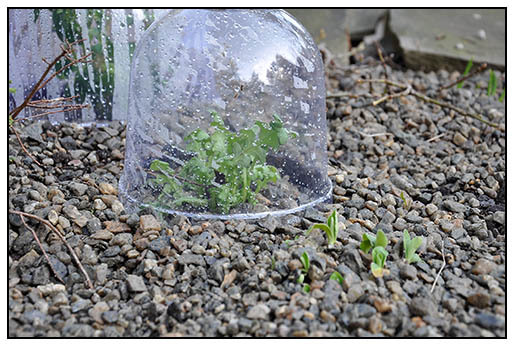 Linaria reticulata and a few species of Clarkia are protected on the coldest nights with cloches. With weather this mild, I will not need these protective domes for long. But here is the risk, it the weather turns cold and snowy again, all might be lost ( we've had over a foot of snow on April 1st), but if the weather turn hot sooner than normal, I too can lose all of these Californian plants, for they love a long, cool spring - most are grown as winter annuals in the San Francisco area and they dislike hot, humid weather. A hot dry summer, might be OK for some of these, as they can be drought tolerant, but it will be the humidity that will do them in. My hopes? That this weather will just stay as it has been. 65 deg. f and 48 deg. at night until the end of May.......rrrrrright. Hey, you won't be laughing at me if this garden takes off - especially with all of the annual poppy seed, and other annual seed such as Eschscolzia, and Agrostemma that's I have also sown in here. Dude....get my surf shorts. 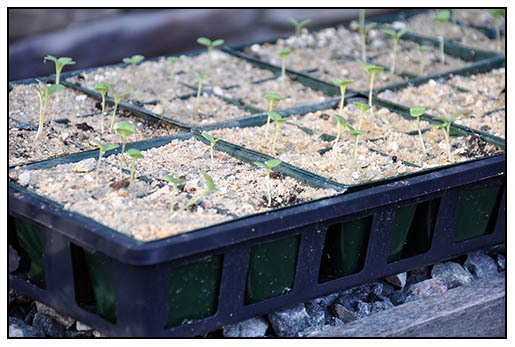 Mathiola seedlings ( Fragrant Stock) have been moved outdoors to take advantage of the fresh breezes and the mild weather. In the foreground, a Primula auricula peeks through a new layer of pea gravel, that I used to top-dress the alpine bed. 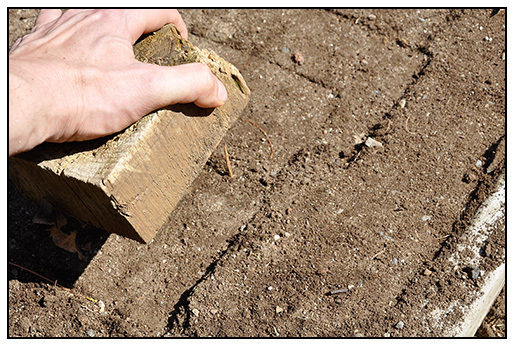 Every few years, the bed needs a new "mulch' of stone, this year, about 3 inches worth was needed. Many alpines are scree plants, and they develop long necks unless they get a new layer of rock - they are designed that way. The screes are tight valleys in the mountains, and stones naturally crumble and fall down, collecting in the scree bed, which is essentially a gravel and rock garden. Daphne shrubs and many alpine primula benefit from the extra stone mulch rather than re-setting the plants higher.Stones are placed right up to where the bare stems start to form leaves, allowing the plants to stay 'in character'. 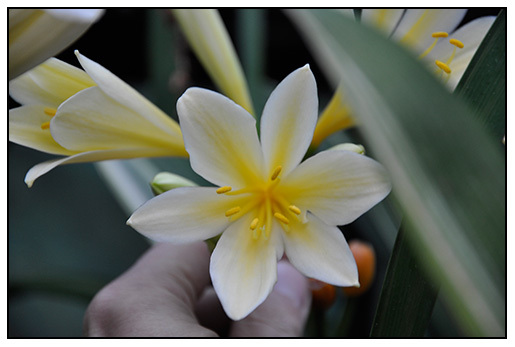 A South African bulbs ( corm) plant in bloom - Melaspharulea ramosa. Only one species in the genus, it is in the iris family. 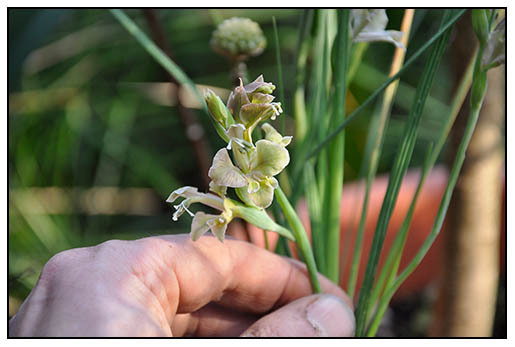 A gladiolus species, G. viridescens blooms in a pot in the greenhouse. 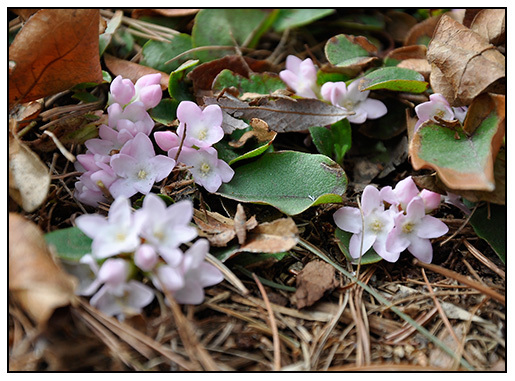 It is one of the last of the winter blooming species to bloom. 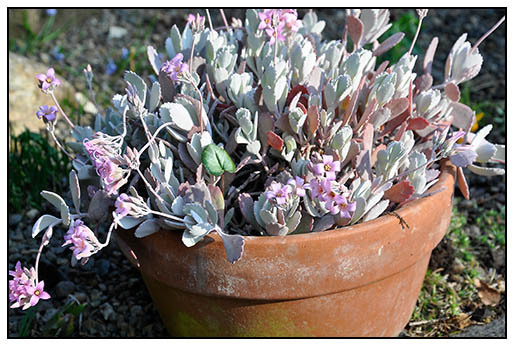 A Kalanchoe pumilla in a clay pot, blooming, it's pink blossoms look nice against the white powdery foliage. After blooming, it will be cut back to cuttings so that I can plant a large, hanging moss basket with it.This was a rescue plant that I got last year. Already, one of my Cyclamen seedlings as made a home in it! I almost forgot to check on this shrub, until my sister called be ( she live above the garage in the other house that I own next door to me ( long story). Anyway, it looks like the garage to my house, but I rent out two apartments in it. I never look at the front of the garage, as I exit the drive way from the other side (I have a corner lot). 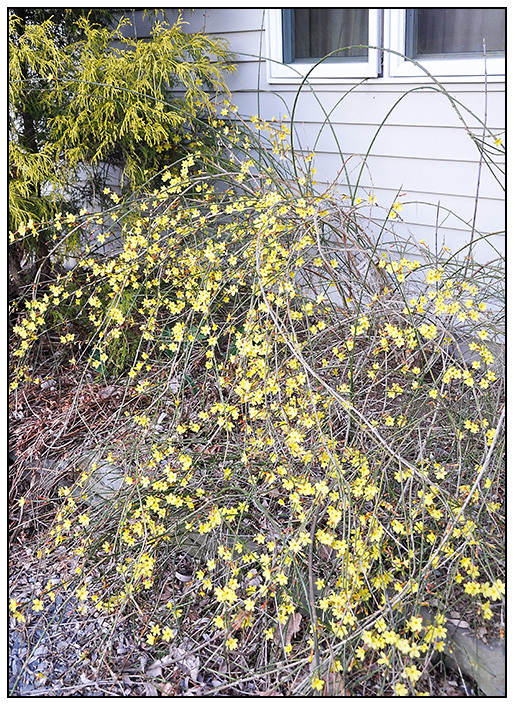 But my sister said "Did you see that yellow shrub blooming in the front of the house? It looks almost like a forsythia?). 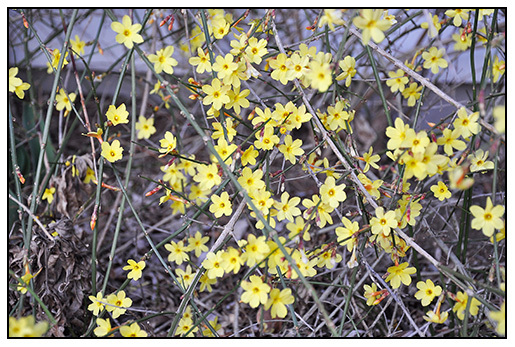 I almost always forget to check on this rarely seed shrub in New England gardens, for Jasminum nudiflorum is indeed, a hardy jasmine ( without fragrance) that can survive in protected areas in USDA Zone 5. My plant lives near the foundation of the garage, with a western exposure which is sunny and warm due to a raised bed, and a gravel drive. It often is in bloom in late January, but this year, it is exceptionally full with blossoms. Here are a few images of it that I took as the sun was setting.